Released in Nov. 1968, The Beatles (popularized as The White Album) remains the most complex, most beguiling of the Fab Four’s masterworks. Whereas Revolver is pop music’s reigning tour-de-force and Sgt. Pepper’s Lonely Hearts Club Band is its multicolored, phantasmagoric cousin, The White Album exists as a strange mixture of beauty and terror, a work of portraiture for the deeply traumatized times in which it was birthed. Nearly 50 years on, The White Album continues to beguile us, thwarting our expectations with each successive listen, defying interpretation with every knotty shift in lyric and tonality as the Beatles take us on the most thrilling, most exhausting, most daring long-playing journey of their career. The Beatles’ achievement with The White Album will be on full display on the weekend of Nov. 9, 2018, as scholars and thinkers come together in celebration of the LP’s 50th anniversary at Monmouth University on the Jersey Shore. Presented in association with the Bruce Springsteen Archives and Center for American Music, The White Album: An International Symposium is an academic successor of sorts to the “Summit of Creativity” conference held at the University of Michigan in June 2017 to commemorate the release of Sgt. Pepper. Monmouth University’s White Album symposium enjoys a synchronicity with Apple’s upcoming release of a remixed version of the LP, which is slated for release on Fri., Nov. 9. To mark the occasion, conference organizers will host a listening session at the stroke of midnight, when the sound of Giles Martin’s arresting new remixes will be summoned forth from the high-definition equipment in the University’s Pollak Theatre. A number of Beatles luminaries will be in attendance, including renowned historian Mark Lewisohn, who will deliver a main-stage talk on November 10th entitled “Double Lives: Between The Beatles’ Grooves.” On Nov. 9, he will be joined by the likes of Rolling Stone’s Rob Sheffield and stand-in Beatles producer Chris Thomas to discuss the album’s enduring significance. Meanwhile, audiophile Bruce Spizer will guide a panel of experts on the LP’s 50-year journey from late-period Beatles masterpiece through the 2018 remixes. In addition to dozens of scholarly sessions devoted to assessing the album’s otherworldly musical and cultural aspects, popular Asbury Park band the Weeklings will bring The White Album to life in concert on Thu., Nov. 8, complete with string and brass accompaniment. On Sat., Nov. 10, the DP Jazz Ensemble will debut a jazz reworking of the Beatles’ convoluted masterpiece. Open to the public, the symposium will provide audience members with a rare opportunity to rub elbows with Lewisohn, the world’s most influential Beatles writer, Sirius XM’s Tom Frangione, and Breakfast with the Beatles’ Ken Dashow. 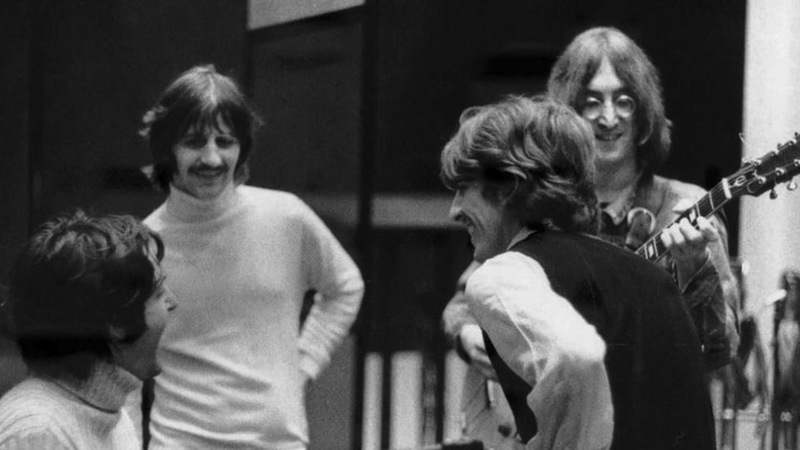 Music fans will also be treated to a production demo room in which experts reveal the myriad ways in which the Beatles originally brought The White Album’s songs to life in the studio. The symposium will conclude on Sun., Nov. 11, in fine style with a live presentation of Scott Freiman’s popular Deconstructing the Beatles series, as well as an interactive pop-up event in which attendees are asked to bring Beatles artifacts and participate in a kind of intellectual show-and-tell. The session will be presided over by a Mystery Host whose identity remains a closely guarded secret. At Monmouth University’s White Album symposium, a splendid time really is guaranteed for all. Visit the website for Monmouth University’s White Album Symposium for more details and registration options. Photo Credit: Image of the Beatles for the White Album Symposium courtesy of Monmouth University. Was in NYC during Labor Day. Obviously, my timing was very poor. To hear Mark Lewisohn, Chris Thomas and Ken Womack talk about the Fab Four – Yeah, Yeah, Yeah!